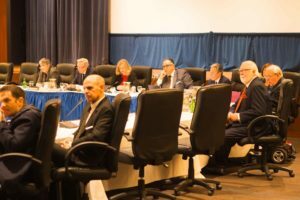 After strong student opposition in Wednesday’s public comment period at the UC Board of Regents meeting, the vote for a 2.7 percent tuition increase has been postponed. Following a statement from UC President Janet Napolitano, regents agreed to revisit this issue at a later meeting. If the vote passes later this year, UC students could face a $342 in-state annual tuition increase and a $978 out-of-state increase. UC officials said financial aid would cover this increase for about half of students whose financial aid already covers their full tuition, according to the Los Angeles Times. About 20 of the 28 students who attended the public comment period spoke out against tuition increase on the table. Many students commented on the timing of the vote, including UC San Diego student Caroline Siegel-Singh, who requested the vote be moved to a time after the state’s finalized budget is approved. Governor Jerry Brown may allocate more money to the UC in the final budget, and many students believed this meant a tuition vote at this meeting would have been premature. Siegel-Singh also emphasized the willingness of students to work with the regents to lobby for more state funding and asked the regents to take more time on the decision. “Proposing and voting on a significant increase for students on the same day is not good government,” Siegel-Singh said during public comment. Brown and Lt. Gov. Gavin Newsom, who students addressed several times during public comment, both spoke against the increase. Newsom announced his opposition in a press release Wednesday and Brown submitted a letter to the board the same afternoon. 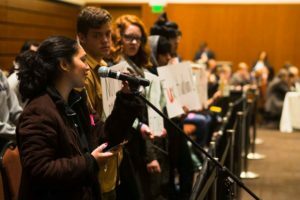 “I urge you to focus on reducing the system’s cost structures rather than increase the financial burdens on students,” Brown said in the letter. Siegel-Singh distributed a petition to the regents comprised of over 3,000 signatures and 26 in-depth narrative accounts from students from all UCs. The narratives detailed houselessness, food insecurity and skipping class to work for a paycheck — a few ways high tuition and living costs impact students throughout the system. “I also would like for all of you to read through this as student narratives from each and every UC campus, as well as alum, debate the impact of this tuition increase and what it would mean for them,” Siegel-Singh said.